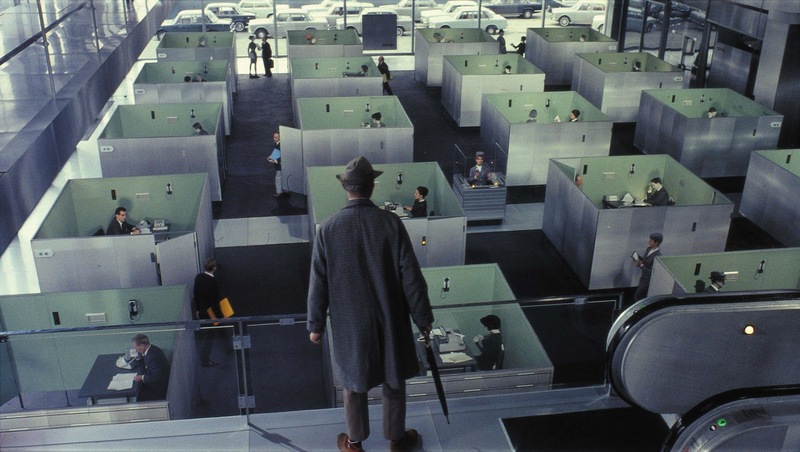 Like Chaplin, France’s Jacques Tati managed to use the simplicity of pantomime and slapstick comedy to produce complex critiques of their respective societies. Some signs of Tati’s malaise with the postwar French culture are seen in some of his earlier work: the ridiculous attempt of mailman protagonist of Jour de Fete to surpass the efficiency of the American Postal Service and in Les Vancances de Monsieur Hulot the dull, boorish tourists who seem unable to enjoy the charm of the beach beyond their seaside resort, for example. But it wasn’t until Mon Oncle and Playtime that Tati’s dissatisfaction with the modern times reached full force: Hulot, Tati’s Chaplin-like everyman, emerges from his rundown but still charming Gay Paree with rues full of fishmongers and greengrocers to find himself trapped in monochromatic glass and steel buildings where robot-like men and women live robot-like lives, which mostly involve inefficient and unnecessary machinery. Ironically, the sterile life of the 50’s and 60’s that Tati mocked is now seen by some with the same charming nostalgia he himself yearned in his films. One of Latin America’s most original filmmakers, Jodorowsky’s filmography is not very extensive but is always very personal and an unforgettable experience for the audience. After decades of being the quintessential cult filmmaker with his unique brand of drug-fueled mysticism, genre deconstruction and Latin American satire, a new generation of film aficionados have discovered thanks to the release of his latest production of The Dance of Reality and a documentary on his adaptation of the science fiction novel Dune that would include, among other things, acting roles for Orson Welles and Salvador Dali, designs by H.R. Giger and music composed by Pink Floyd. Like most elements in Jodorowsky’s films, the castration scenes have a symbolic subtext. In this case, it’s portrayed as an act of submission or defeat from an alpha male figure such as The Coronel from El Topo after losing against the protagonist, El Gringo in Santa Sangre while being killed by his wife for his extramarital affair and in The Holy Mountain, perhaps Jorodowsky’s most perplexing film to date, is done as a ritual by the leader of a military-like group to all its members, only to be deposited in a jar and placed in a chapel-like hall. Martin Scorsese is one of America’s most influential directors, a living institution. While many directors of the New Hollywood movement became irrelevant with time or lost their leverage through disastrous vanity projects, Scorsese managed to keep himself fresh with his personal brand of gruff, lowbrow lives presented in a polished, fast-paced manner. In most of his films, two themes appear continuously intertwined: The American Dream and the path of brutality and violence related to those who wish to own it or would do anything to keep it. What every American aspires is, of course, a general idea that changes from person to person. 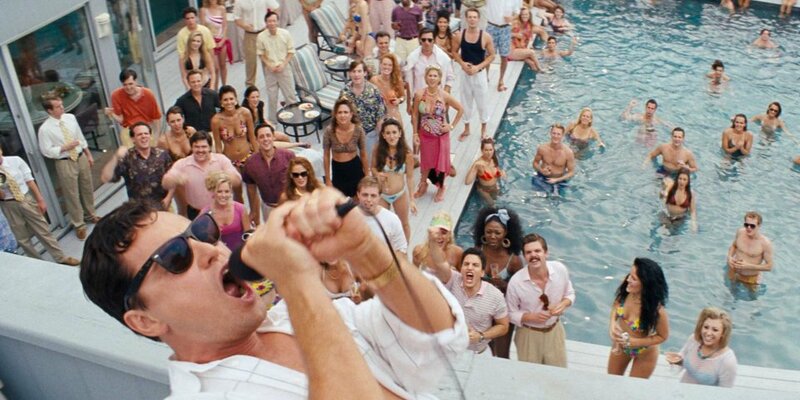 It could be recognition (Raging Bull, The King of Comedy) or to keep a sense of purity that is considered violated (Taxi Driver, Gangs of New York), but what all of them desire, from Goodfellas to The Wolf of Wall Street, tends to be simply “more”. More money, more things, more power, more love, bigger and more luxurious houses, better and fancier cars, women with larger breasts, more happiness, all what they saw on television and cinema and through the window but never have had. And their tragedy is, of course, that others, the rest, enjoy their spoils unsuspecting how much blood has run for it. The final shot of Gangs of New York sums it up rather well: The grave of Billy the Butcher fades away while the city of New York rises in its splendor. The remains of those in the shadows make possible the light to shine stronger. Considered by many as Italy’s most emblematic film director, the films of Federico Fellini reflected the wild and often contradictory Italian life and culture, especially in the 20th century. La Dolce Vita, Otto e Mezzo, Amarcord, and many others have for long become landmarks of cinema, influencing several generations of filmmakers. His films were crowded with characters full of passions and obsessions from every era and social position. From the suave artistic elite of La Dolce Vita, Otto e Mezzo and E La Nave Va to the picaresque charm of the romantic past portrayed in Satyricon, Amarcord and Roma, Fellini embrace the most outlandish bits of reality without completely falling into grotesque exaggeration. But there’s always a heart in society, despite the ailments of modernity, politics and religion. And that heart is a woman. But not any type of woman. 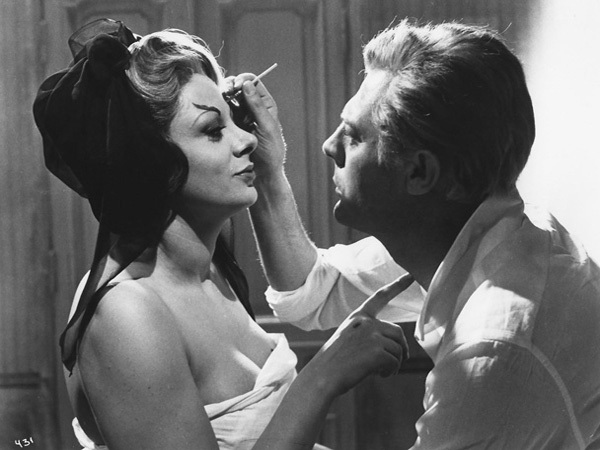 Fellini, like Marcello Mastroianni’s character in Otto e Mezzo, seemed to have a personal harem in his imagination. More famously, he was fond of large, rough, maternal women, such as the tobacco seller in Amarcord, the prostitutes in Roma and of course, La Saraghina in Otto e Mezzo but also kept a special place for delicate, ethereal beauties like the protagonist’s wife in the previously mentioned film or the foreign movie star played by Anita Ekberg in La Dolce Vita. No other director has left a legacy portraying the idiosyncrasies of the Japanese culture in such a sublime and universal manner that Akira Kurosawa. Director of Seven Samurai, Yojimbo, The Throne of Blood and many others that helped to shape the icon of the samurai in the collective consciousness of the people around the world. A recurring and rather fascinating motif is present many times in his filmography: A stark contrast between the innocence and purity of youth with those who are near their demise, especially those who, through acts of redemption or penitence, manage to reach a state of purity again. 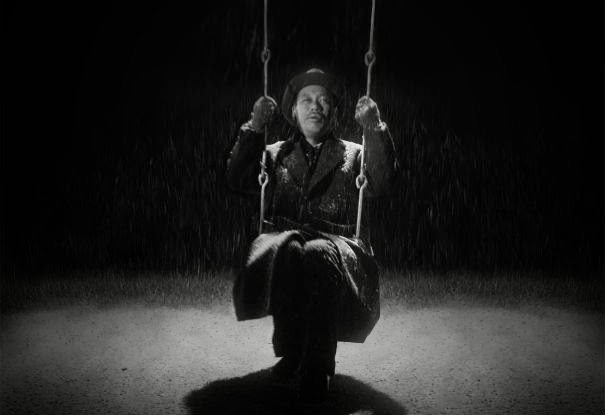 Ikiru, a 1952 movie about a dying bureaucrat who struggles to build a playground so his life won’t be meaningless is perhaps the most famous example of this, but it can be seen at the end of many of his movies, such as the baby orphan in Rashomon, the grandmother in the rain accompanied by a tender tune of Schubert in Rhapsody in August or the funeral procession in Dreams. Generally, this could be seen as renewal and continuation of life, despite extension and obliviousness.